Published by Pan Macmillan on 12th July 2018. Just the idea of seven of the best YA authors collaborating on a book is enough to make me need to read it. 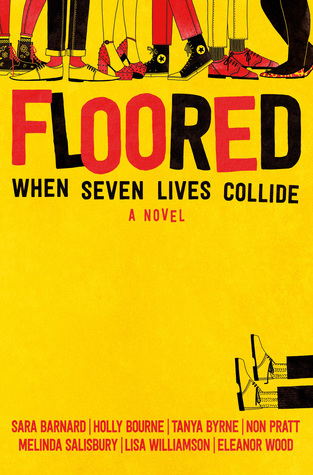 In Floored, There are six main characters and a narrator. Hugo, Sasha, Joe, Kaitlyn, Dawson and Velvet. The group are together in a lift when something happens and this shared experience means that they stay in touch for the years that follow. Life drama ensues. They all come from different backgrounds and are heading down different life paths, meaning there is clash after clash in their friendship. There’s also some complicated romance dynamics thrown in too. Unrequited love, crushes, manipulation, break-ups, long distance and so much more. The story is told over the course of five years so you get to see these characters grow and change. I loved the element of the Whatsapp group and how the six kept in contact. It felt very current and also became a space for them to mature. Without a doubt, my favourite character has to be Kaitlyn. 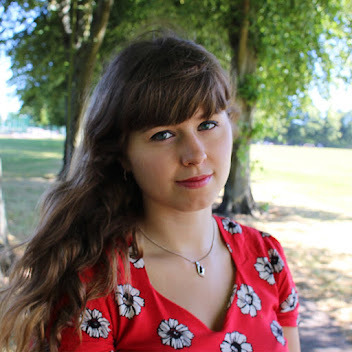 She’s losing her sight at the start of the story and so it’s one of the rare YA books that focuses on a character with visual impairment. It’s hard to find characters like Kaitlyn, especially because books, if they feature disabled characters, usually opt for those who are completely blind. There's very rarely a sense of an in between state like Kaitlyn's visual impairment. Kaitlyn is also the sassiest character I’ve come across in a long time. I loved her bluntness and her hard exterior. She always seemed to know what she wanted and stood up for herself. When I was seventeen, my best friend was losing her sight and the perspectives of Kaitlyn’s friends during this time felt very true to my own experience. I’m really interested to hear what visually impaired readers think of her. I also had a soft spot for Dawson, who’s acting career has washed up. He’s losing self-confidence and the only career path he’s ever known. Joe's home life made me cry towards the end. I worried about Velvet and Sasha too because of the lack of support they had from their families and spent the whole book hoping they got the better futures they deserved. From deliberating over going to university, to making stupid mistakes, these friends grow and evolve in a moving way. It’s not all a sob fest, there are plenty of Harry Potter references and snarky comments, as you’d expect. Just prepare yourself for all kinds of emotions and be careful about reading it on a train like I did because there’s a high probability you’ll miss your stop. I know that collaborative books like these won’t happy very often, which is what makes me treasure Floored even more. It’s a special book with a special place in my heart. Thank you Pan Macmillan for sending me a proof to review.